The United Nations General Assembly (UNGA) voted for the first time Thursday on a resolution condemning Hamas. Though the resolution failed to garner the requisite two-thirds majority, a simple majority of member states joined the United States and Israel voted in favor. The UNGA gathered Thursday afternoon for the 47th plenary meetings. The sole item for the agenda was "The situation in the Middle East." The United States introduced Resolution A/73/L.42, "Activities of Hamas and other militant groups in Gaza." Though non-binding, the draft resolution was the first in the UNGA to condemn Hamas. 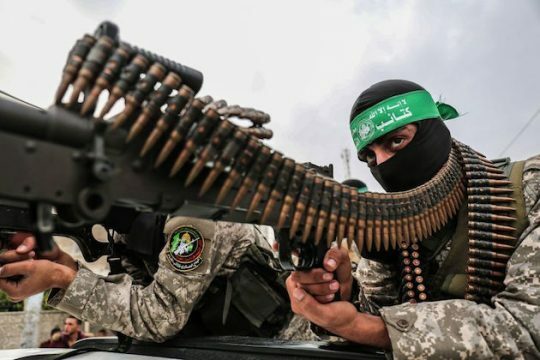 The United States has designated Hamas a terror organization. Prior to the vote, the U.S. mission to the United Nations tweeted about the vote, warning that failing to condemn Hamas would expose the institution's "lack of credibility." In her opening remarks, U.S. Ambassador to the UN Nikki Haley offered support for the amendment, arguing it was time to hold Hamas accountable. She noted that the world held a double standard, excusing Hamas’ frequent terror attacks against Israel. "The question before us now is whether the UN thinks terrorism is acceptable if, and only if, it is directed against Israel," she said. The first order of business was a vote on the kind of majority needed for the amendment to pass. Haley defended a simple majority. The Kuwaiti ambassador, joined by the Bolivian ambassador, requested a two-thirds majority. Seventy-five nations voted for a simple majority, 72 for a two-thirds standard, and 26 abstained. The procedural vote was followed by several minutes of remarks. Representatives of the governments of Iran, the world’s leading state sponsor of terrorism, and Saudi Arabia, which likely orchestrated the murder of journalist Jamal Khashoggi, came together to decry the criticism of Hamas. The Saudi Arabian representative accused Israel of disregarding international law and claimed that condemning Hamas would "undermine" the two-state solution. Saudi Arabia considers Hamas' "parent movement," the Muslim Brotherhood, a terror organization. Nevertheless, Saudi Arabia pointed the finger at Israel, accusing it of being the obstacle to peace in the region. The Iranian representative characterized opposition to Hamas as "politically unwise" and "illegitimate." In a statement, Hamas thanked the Palestinian Authority and the nations that had fought the resolution. Hamas, which took control of the Gaza Strip in 2007, has had a contentious relationship with Fatah, the ruling party of the Palestinian Authority, which governs Area A in Judea and Samaria. Despite recent progress between the two, talks broke down again in recent months. The resolution called for "tangible steps towards intra-Palestinian reconciliation," including a return of political control of both regions to the Palestinian Authority. The General Assembly then voted on the resolution. A majority of member nations, 87, voted in favor. Fifty-seven voted against, and 33 abstained. The resolution failed to obtain the required two-thirds majority. The nations of the European Union, which have long criticized Israeli policies, voted with Israel in support of the resolution. Despite the outcome, the United States and its allies considered the outcome a success. Israeli Ambassador to the UN Danny Danon called the resolution a a "win-win," satisfied that world governments had to go on record with their views on the terror group. "If we win, it will be a historic achievement. And if we don’t win, at least we succeeded in putting Hamas’s activities on the global agenda," Danon told the Times of Israel. Despite failing, the resolution coming to a vote and garnering a simple majority represents a final majority for Haley at the United Nations. Haley announced in October she would be resigning at the end of the year. This entry was posted in National Security, Politics and tagged Hamas, Nikki Haley, United Nations. Bookmark the permalink.